Winter is almost here, and now is the time to ensure that you’re ready for the first snowfall that lands on your doorstep—literally. Even though a fresh blanket of white snow is a beautiful sight, the inevitable task of removing it can be a back-breaker if it isn’t done properly. What’s more, snow removal, especially shoveling snow for an extended period of time, can be painful and potentially dangerous in subzero temperatures. From shoveling to opting for a snowblower, these tips can help you to quickly and safely clear the snow from your driveway. You can either shovel the snow after every few inches that fall or wait until the storm ends and remove the snow in layers. If not carefully considered, this can be painful work. The use of the right shovel is needed. A pusher shovel is needed to first push the show to the edges; then a wider, deeper shovel is needed to lift the snow. While plastic shovels can be cheap and lightweight, one of these is less likely to catch as much snow. On the other hand, a metal shovel will be considerably heavier and may limit how much time you can spend shoveling. Remember to only remove as much snow as you are comfortable lifting. The cold temperatures and repetitive motions can lead to serious injury. It is incredibly important to remember to take breaks as you shovel snow. Always start by stretching your muscles, wear plenty of warm layers while outside, and head indoors after a few minutes to rest and warm up. Quite simply, using a snowblower is the quickest way to clear large areas of snow. Clearing tons of snow per hour, these machines have the power to send flakes flying—instantly. When using an Ariens snowblower, you can find the right optimum speed that allows the machine to clear the path and get the job done fast. Your clearing technique will depend on your property. In general, you don’t want to throw snow on top of paths that you’ve already cleared. The best method for driveways that have clearance on both sides is to start in the middle and throw the snow toward one edge of the driveway. Then, make a U-turn and come back down the other side, and keep alternating until you’ve cleared your desired space. By clearing snow this way, you won’t have to constantly adjust the chute, and any snow that falls short will be cleared on the next pass. When you’re done, let the machine run for a few minutes to dry out. 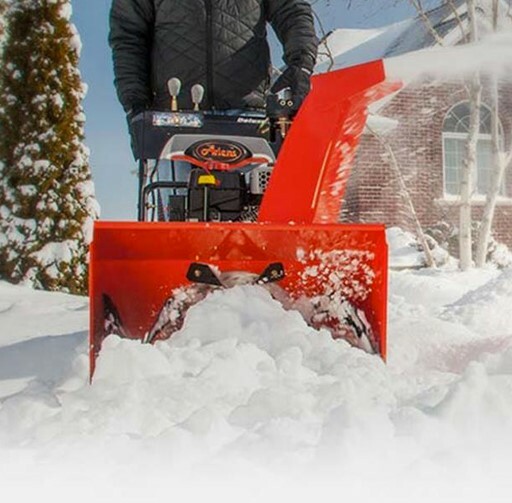 This will help prevent important parts from being damaged by freezing, allowing you to rely on your snowblower year after year, winter after winter. From commercial snowblowers to specifically made machines for steep driveways, to nifty Ariens compact 24 models, Brinkmann’s Hardware has the right snowblower for you and your property. Stop by your local store so that you’re prepared when winter arrives.